Welcome to Electronic Enterprises, Supplier and Distributor of Electronic Relays. The company was established in 2005 at Hyderabad. Good financial position and TQM make us unique in the industry. Large production capacity, Safe and durable packaging make us the first choice of our clients. 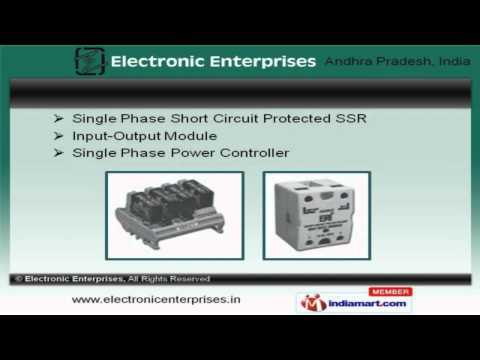 We offer a wide array of Solid State Relay and Single Phase Solid State Relay. Our Single and One Phase S S R Relay are acknowledged for their functionality. We offer Input-Output Module and Single Phase Power Controller that are widely acclaimed in the market. Single Phase Chassis and Short Circuit Protected offered by us are available at affordable prices. Along with that we offer P C B Mounting and Solid State Relay for Electronic Circuits that are a class apart. We also provide Single Phase S S R Relay for Electric Work that are extremely reliable.